Political conversation in Twitter increases when a General Election comes close. Analyzing the topics discussed by users provides interesting insights of this growing public conversation on politics. In COSET, the aim is to classify a corpus of political tweets in 5 categories of classification: political issues, related to the most abstract electoral confrontation; policy issues, about sectorial policies; personal issues, on the life and activities of the candidates; campaign issues, related with the evolution of the campaign; and other issues. The tweets are written in Spanish and they talk about the 2015 Spanish General Election. In the training phase participants will be provided with Twitter Ids and their manually issue codification. We cordially invite all researchers and practitioners from all fields to participate in COSET. To develop your classification, we provide you with a training data set that consists of the Twitter Id and their issue category. Click here to download the training corpus (The file is password-protected. To obtain the password, you need to write first to coset2017@gmail.com). To test your classification, we provide you with a data set that consists of the Twitter Id. Click here to download the test corpus (The file is password-protected). The metric used for evaluating the participating systems will be the F-1 macro measure. 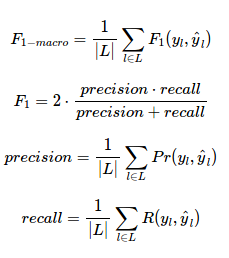 This metric considers the precision and the recall of the system’s predictions, combining them using the harmonic mean. Provided that the classes are not balanced, we proposed using the macro-averaging method for preventing systems biased towards the most populated classes. This is the ranking of the results, after evaluating the 39 submissions received for the COSET Project. The COSET Organizing Committee appreciates all the participants’ interest on this task.